You know what they say about people from Yorkshire – they don’t like to part with their money. The thing I love to hate when it comes to weddings is the cost. It’s the happiest day of your life and everyone is out to make you pay through the nose for it. So a big saving that we could make is on garments. I have a sewing machine and I know how to use it. The DIY approach also means that you get closer to the thing that you want than if you try to find it pre-made. And the participants get to keep the waistcoats afterwards. 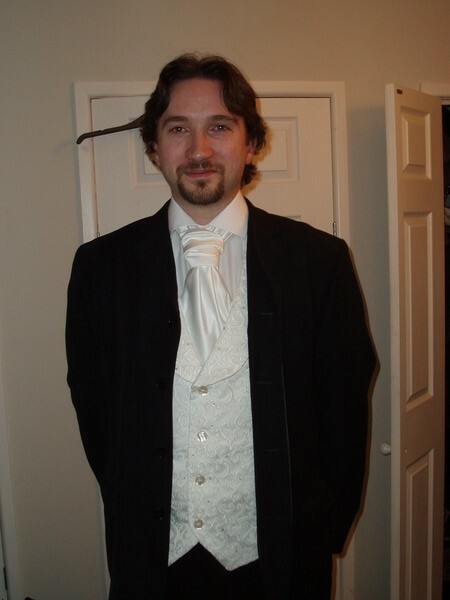 If I made waistcoats and cravats for the key gentlemen (groom, best man, and father-of-the-bride) and asked them to wear their own suits we could save a packet. They’ve all turned out really well. I’m pretty happy with the three I’ve made so far. And the best part is that I have enough fabric left to make a fourth waistcoat for our newly promoted usher/musicmonger. Lately I’ve been going overboard a little at C&H Fabrics in Winchester. Most notably at the remnants table. Out of all the fabric shops I’ve been to C&H has the biggest remnants table. I go into the shop for fabrics and supplies for my course and end up coming out with coming out with piles of interesting looking fabrics. My last visit was especially fruitful, I found an interesting print that I made up into a top (above) and a nice piece of silk suiting which I made up into a skirt (below). The skirt went absolutely perfectly, unlike any other garment I’ve made. 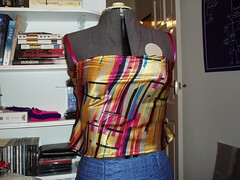 I didn’t forget any steps or put the zip in the wrong side or cut out the wrong pattern pieces. I’ve done all of these before and usually rectified the garment and made the best of it – but I’ve always remembered the mistake when wearing the garment and it’s niggled at my perfectionist bone. 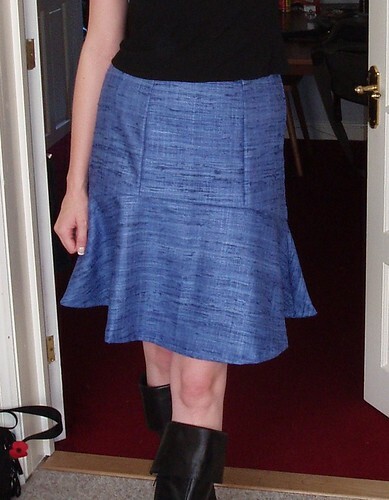 However this skirt went perfectly – I adore it. The only problem with it is that the loose weave silk is slightly scratchy (not very – as it’s nice and hypoallergenic and soft) so I think that a lining is in order. I’ll make a cotton lining for the top sections above the flounce which should make it more comfortable, and – according to my Mum who made a skirt from the same pattern, came across the same issue and decided on the same solution – should make the skirt hang better. I was able to get back into dressmaking recently due to two recent purchases: the first – a dining room table which allowed me to cut out fabric, the second – a dressmakers dummy, which made hemming easier (though it doesn’t necessarily make me any better at it). 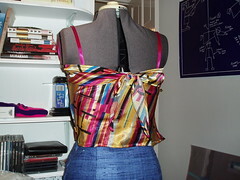 Here is my most recent dressmaking effort.